Orders will begin shipping on July 26. The LotFP: RPG store is here. 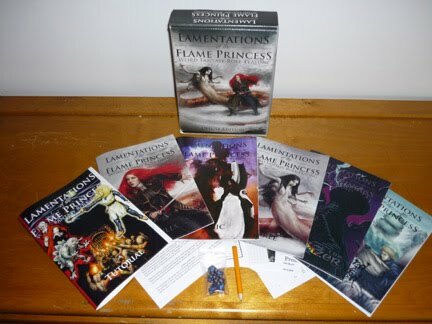 LotFP Weird Fantasy Role-Playing box: 50€ worldwide, economy shipping included. You can upgrade that shipping method if you'd like (only one upgrade needed even if you buy multiple boxes). If you order before I get home from Ropecon on July 25, you can add Hammers of the God for 8€ (you must be ordering a box to get this price). Tower of the Stargazer and Weird New World are included in the box set. Death Frost Doom is back in stock with a 3rd printing, and of course Grinding Gear, No Dignity in Death, and People of Pembrooktonshire are still available. Orders without the box included will ship Priority. I won't publicize this anywhere else until tomorrow morning. You can if you want to. Just hit the pay button! Is there a reason why the ordering system won't take my credit card? I mean, I know I have enough credit to make the purchase, but the system keeps saying I can't use my card for the payment. HELP! I had the same issue when paying one of the artists earlier in the week. I just tried again later and it went through. I'm not missing out on another one of these box deals. Dammit. Ok, I figured it all out. No worries. So, if you start shipping on the 26th, and I did the basic shipping, I guess I'm looking at over a month before I get my box? Cool Looking RPG + Me + I've Actually Got Money Right Now + Internet = 1 sale. Jim, can you teleport them from Finland? 13 sold in the first hour. Not bad. Thanks everyone! Economy shipping is weird here... I've had packages reach people in the States in 7 days, and I've had packages take almost a month. Never had one take more than that though. >>Jim, can you teleport them from Finland? Yes, but they end up on the moon instead of the intended destination. And... purchased! Got my e-mail and everything. Just placed my order! Can't wait to see this one. Congrats Jim! Priority post takes 2-3 days to get most places in Europe. I'll mail yours on the 26th for sure, and it should be there before you leave barring any post office complications after I drop it off. Wachynain, good to see you here!!! Just placed my order too!!!. Another box to Spain!!! Alguém do Brasil já pediu isso? Just placed my order for the boxed set. Yes! It's real now! Congrats on your work Uncle Jim! First 12 hours = 36 orders, and most people ordered more than one item. 36 orders isn't going to change the world, but it's enough to start changing my world. More than 1 in 20 copies of the print run are now gone in only half a day. My order has gone through. Get ready to send one down under. I'm looking forward to this. Cheers. I'm not yet ready to get the game itself. Too many retroclone choices, and I'm not likely to get my group to play any of them; it took a fair bit of whingeing and Machiavellian scheming to get them to abandon D&D4. Perhaps one day, as it's a great-looking package. Anyway, Hammers of the God looks like my kind of thing, so I bought that. With regard to compatibility with the old, original D&D stuff (from the Red Box and on through the Rules Cyclopedia) as well as with the retro-clones, could you give us an idea of what will be usable for LofFP with a minimum of tweaking? It is most readily compatible with Basic style games, but Advanced games are a real snap. There are extensive conversion notes in the game. >> Priority post takes 2-3 days to get most places in Europe. I'll mail yours on the 26th for sure, and it should be there before you leave barring any post office complications after I drop it off. I hope so. I'll tell you my plans. I'm departing to Iceland (yes, Iceland) on the 31st. I'm going to spend 15 days trekking in the ice cold volcanos and fjords during the morning, and playing LotFP during the evenings (although I'm afraid there's no night there in August). How cool is that? >> Wachynain, good to see you here!!! Same here! It seems that we both like fine things in life.